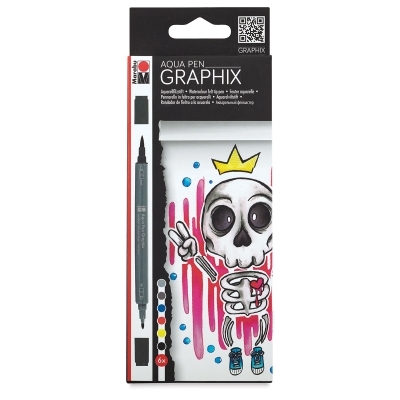 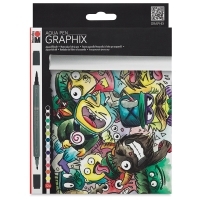 For watercolor painting on watercolor paper, Marabu Graphix Aqua Pens provide high-quality, lightfast, waterbased pigment ink in a range of brilliant colors. 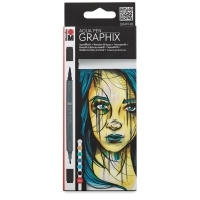 Use the two tips (one for contours and the other a flexible brush tip) to apply color, then use a wet brush to spread it. 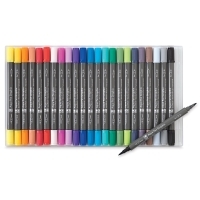 A low-odor formula makes these pens pleasant to use. 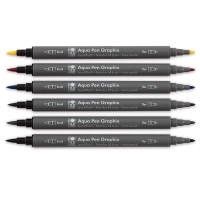 Usage Note: Never dip Marabu Graphix Aqua Pens into water. 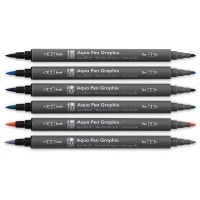 Metropolitan, Set of 6 — Includes Black, Gentian, Light Blue, Aqua Green, Tangerine, and Light Grey. 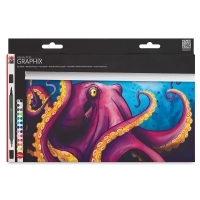 Octopy, Set of 24 — Includes one each of Amber, Aqua Green, Antique Green, Azure Blue, Black, Cherry Red, Dark Brown, Dark Green, Grey, Lemon, Light Blue, Light Grey, Light Vermilion, Lime, Make-up, Petrol, Pink Candy, Plum, Red Orange, Rose Pink, Smoky Blue, Smoky Quartz, Tangerine, and Ultramarine. 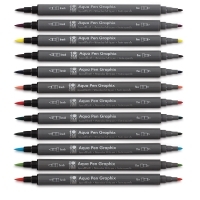 Mega Mash, Set of 12 — Includes one each of Black, Lemon, Red Orange, Cherry Red, Light Pink, Plum, Antique Green, Avocado, Dark Green, Aquamarine, Petrol, and Dark Brown. 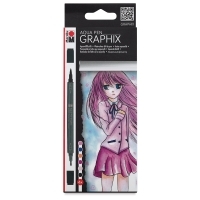 Ma Ke Manga, Set of 6 — Includes one each of Black, Lesh Pink, Rose, Raspberry, Dark Ultramarine, and Amber. 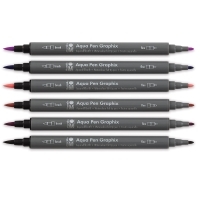 King of Bubblegum, Set of 6 — Includes one each of Black, Yellow, Light Vermilion, Smoky Quartz, Azure Blue, and Grey.